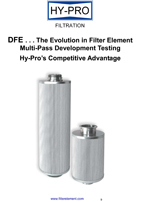 Dynamic Filter Efficiency (DFE) is the evolution in hydraulic and lube filter element performance validation and development, and Hy-Pro’s competitive advantage. 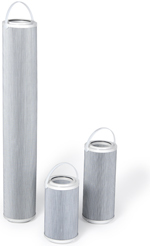 Dynafuzz stainless fiber media element upgrades are impervious to strong acids that can form in phosphate ester fluids and compromise glass media integrity. Ideal for steam turbine EHC systems that have had problems with media migrations. 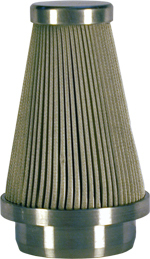 Hy-Pro Dynafuzz stainless fiber media element upgrades were developed to solve a steam turbine EHC system problem where glass media fibers were migrating and clogging servo screens Strong acids can develop in phosphate ester fluids and compromise media integrity in cases of high acid number and long term exposure. Once OEM glass media pump discharge and servo pilot filter elements were upgraded to Hy-Pro Dynafuzz elements the problems with clogged servo screens went away. 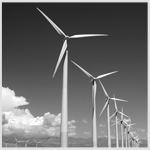 An increasing population of wind farms and turbines surpassing the warranty period = opportunity to help these users improve reliability. 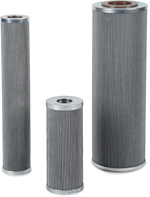 Spin-on filter element upgrades with 1 1/4″ BSPP G thread. HPQ290960S elements ares used on water misting / fogging systems on combustion turbine air intake for cooling and NOX emmission controls. Contact Hy-Pro for more information these critical air intake spray system element upgrades. Hy-Pro lube specific lube elements optimize bearing lube element life where the combination of high viscosity, high flow and low terminal ΔP alarm settings (15 psi / 1 bar) require the lowest possible clean element pressure drop and high efficiency particulate removal. Hy-Pro DFE rated high efficiency glass media element upgrades are field proven to improve single pass ISO codes through main bearing filter duplexes and also to lower overall lube system ISO codes. Hy-Pro lube specific lube elements are designed to optimize life of bearing lube elements where the combination of high viscosity, high flow and low terminal ΔP alarm settings (15 psi / 1 bar) require the lowest clean element pressure drop and high efficiency. 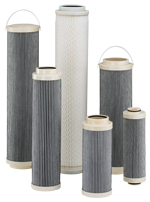 Filter element spark discharge is a recognized cause of fluid degradation in hydraulic and lube oil systems creating soluble by-products and sub-micron carbon particles that deplete additives, cause fluid darkening and lead to varnish deposits. Hy-Pro NSD (Non Spark Discharge) elements are the solution. Didn’t find the element you need in our interchange guide? Please use this datasheet to provide the necessary information for us to quote it. Please also include several digital photos and information on the application including fluid, operating temperature and application. Hy-Pro manufatcures several transmission filter kits for Allison and ZF automatic transmissions in high efficiency high capacity glass and stainless mesh medias. Hy-Pro transmission filter kit upgrades are available for many Allison transmissions including 3000, 4000, B300 / 400, 300MH / 400MH and for many other transmission models and manufcturers. In addition to providing full kits with elements with seals we also offer individual elements and seal kits. 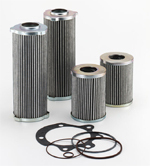 Hy-Pro filter element upgrades are available for use in Turbo TOC oil conditioners. High efficiency glass elements for pre-filter, coalesce & separator and post-filter stages achieve a higher efficiency particulate removal, ensure water separation through equipment plus lower overall turbine lube reservoir ISO codes. Hy-Pro A media water removal elements remove free water from hydraulic & lube oils and fuels down to fluid saturation point. Water removal A media is used in combination with any selection of Hy-Pro DFE rated glass media and is available in any Hy-Pro element configuration. Ideal for use in filter carts and dedicated off-line systems for conditioning fluids that are in service or for dewatering bulk fluids during fluid transfer. Consider Vac-U-Dry vacuum dehydration systems for removing water and particulate from oil in large reservoirs with periodic water contamination or constant water ingress. V1 mini vacuum dehydrators remove water from small hydraulic & lube systems and gearboxes. For fuels COD diesel coalesce skids rapidly remove free water with high single pass efficiencies on bulk tanks and during tanker filling or dispensing.